Richard Lugar received the Knight of Freedom award for his actions and support of the Polish accession process to NATO structures. Steadfast supporter of American leadership in the world, tough internal security policy, free trade and promotion of the economic growth. A resident of the state of Indiana in the fifth generation. 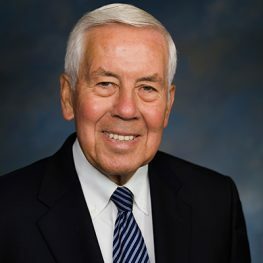 Richard Lugar is the longest-serving senator of the Republican Party and a Member of Congress in the history of their state. In the years 1985-1987 and 2003-2007 chaired the Foreign Affairs Committee of the Senate. Senator Lugar was a staunch advocate of Polish accession to NATO and became famous as the creator of the Program for Cooperative Threat Reduction Program also known as the Nunn-Lugar (American financial assistance program for the CIS countries, which, in connection with the collapse of the Soviet Union found itself in possession of nuclear weapons). Its aim was to strengthen control over the post-Soviet nuclear infrastructure.